Vector drawing is a way of drawing where you draw or construct a line drawing by using vector lines. These lines are based on mathematical curves and are very suitable for producing clean and smooth drawings which preserve quality when edited or resized. Maybe the most important feature of vector lines is that they can be edited or reconstructed. When you draw a complex shape with an ordinary brush you usually first need to draw a precise underlying drawing. With vector lines the underlying drawing can be simple or just a sketch – you achieve precision by editing the drawing. 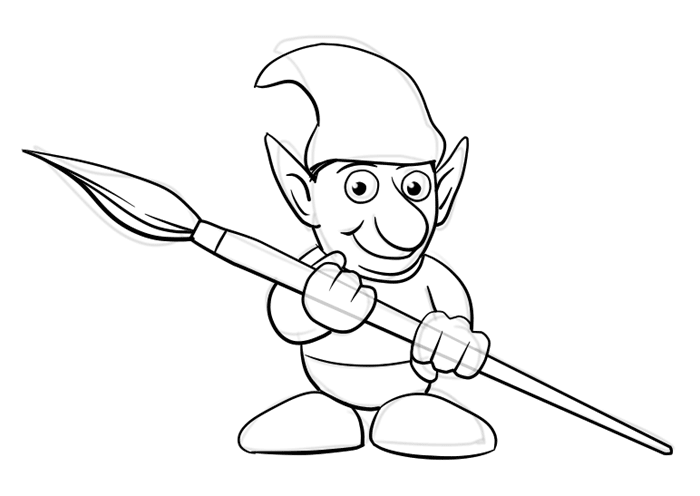 JugiPaint provides two types of vector curves – pen lines and polycurves. These lines are named by the tool which creates them – the pen. The pen mimics ordinary brush and is suitable for drawing organic shapes. I draw a simple underlying sketch as a guide (with an ordinary brush). The pen tool in the freehand pen mode was used to draw most of the lines. Some lines were tough to made right in the freehand mode so I resorted to the connect points mode. I used the Eraser and Reshaper tools to fix and modify parts of the drawing. The pen curves are built from many vertexes and editing by modifying the individual vertexes is not practical. Well, the lines made with the connect points mode have as many vertexes as you made but in general, by their mathematical nature, the pen curves require more points and even distribution for producing smooth curves. The connect points mode can be very usable when you need precision (or have a hard time drawing particular shapes on a non-display graphic tablet) but it has also few other advantages – you can set sharp corner or close curves directly when creating a line. Set size scale to compensate for the missing pen pressure size reduction. You can later edit the line with the edit curve – adjust curve width tool to give it variable width. Use keyboard shortcuts: hold down Ctrl to insert a corner vertex, press Backspace to delete the last added vertex, press Esc to cancel the line. When you draw a long straight segment after the curvature precede it with two corner points to obtain correct continuity. Click the first point to close the curve. Polycurves are suitable for drawing objects made from geometric shapes. Here is an image drawn by use of polycurves. I draw a simple underlying sketch as a guide. The drawing A was constructed with the polycurve tool using the custom polycurve constructor. Note how the lines can overlap each other. At this point I took care only that the curved shapes were (more or less) correct and did not bother too much where they start or end. Using the edit curve tool I adjusted vertexes and hide the curve parts to achieve the final drawing B. The colored drawing C has nothing to do with the vector tools. 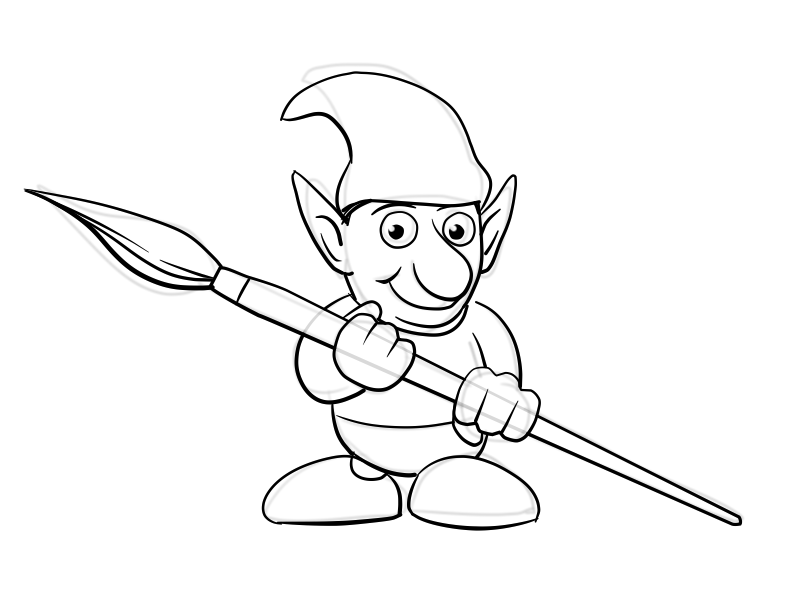 JugiPaint currently does not have vector coloring capabilities for such tasks. Luckily the coloring by using the bitmap layer tools is easy. I made a layer bellow the vector layer and fill in the colors with the magic wand tool (some missing corners were colored with the “sharp pen” brush). Another layer was made above the vector layer and clipped to it. It was used to colorize lines with a brush. It is possible to set colors to the vector lines directly but I prefer keeping line drawings black and use separate layer for colors. 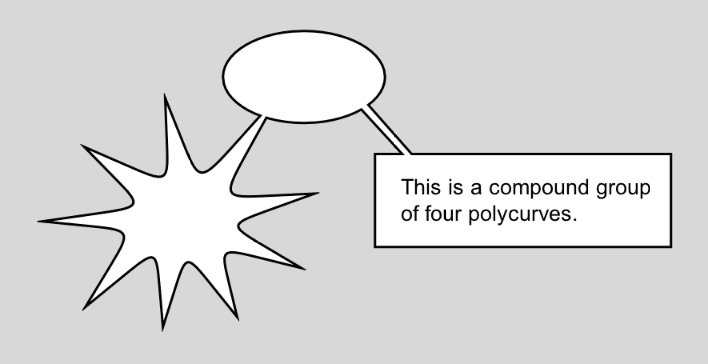 The polycurve tool creates curves with the default Curvature parameter and with the Connect neighbour curves parameter on. This enables good curves for drawing various objects. If you need more control over the curves you can edit them with the Edit Curve – Move and adjust points tool. The following picture shows some variants of a curve segment with different parameters. version A : Connect neighbour curves is on, default curvature value (55) is used . version B: Connect neighbour curves is off. This allow that the end point of a curve segments is not connected to the start point of the next curve segments. When that is the case a straight line is drawn between these two points. version C: The same as version B but the curvature has been changed for both middle vertexes. Do not add too much vertexes if not needed. Polycurves are smoother when smaller number of vertexes is used. The ellipse in made from four vertexes positioned in the rectangle shape. Overlap curves freely to achieve desired shapes. Later use the Edit curve – Hide curve parts tool to hide parts of curve you don’t want to be seen. A compound group affect the rendering of the curves within the group – they are rendered with their common outline. Only closed curves can be attached to groups and some effects like the variable line width and line hiding do not work on them. They are not really usable for the illustrations like shown in the images above but they can be very handy when creating objects like comics balloons. The compound groups are managed in the Curve properties tool.